We survive on coffee and carbs. And making sure everyone who starts their day with us gets great food, great service, and leaves our shop happier than they came in. We don't really have a motto or mission statement for our business. 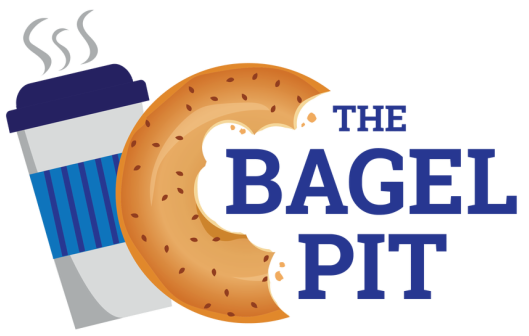 We run The Bagel Pit as if we are the customers. So expect great service with a smile, pretty good food, and even human interaction. Everyone is welcome here and everyone should feel comfortable. That is our goal. If we aren't living up to it, please let us know. Seriously. If we are doing a good job, feel free to tell us too. All we ask in return is for you to leave here and try your hardest to spread kindness and love. We all know the world needs that. grab a seat. Make a friend. Enjoy the simple pleasures. A little insider peek at our pit crew working! Thanks to all of our awesome customers for keeping us busy... We've been in business for a year and 8 months thanks to you!